In a large freezer bag, combine the chicken tenderloins, lemon juice, and Greek dressing. Seal and refrigerate, allowing to marinate at least 1 hour or overnight. In a large skillet over medium heat, cook the chopped bacon until lightly crispy. Remove the bacon using a slotted spoon and place on a paper towel to absorb excess grease. Add the chicken to the pan with the bacon drippings and saute the chicken until cooked through, about 4-5 minutes on each side. Remove from heat. Cut the cooked chicken up into small pieces and add to a large bowl. Mix in the cheeses, spinach, and dill. Spray each tortilla lightly with olive oil spray. With the oil side down on a nonstick baking sheet, top half of each tortilla with the filling mixture. Fold and arrange to fit on the baking sheet– you likely will need to work in two batches. Continue until the fillings are all used up, depending on how thick you want your quesadillas to be. Spray the bottom of an additional baking sheet with nonstick spray. Press the second baking sheet on top of the quesadillas. Bake until golden brown and the cheese is melted, about 15 minutes. Repeat for the remaining quesadillas. 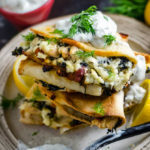 Cut the quesadillas in half and serve warm with tzatziki or let cool to room temperature and freeze in a large, sealable freezer bag for later. To reheat the quesadillas, place in 350°F oven until warmed through, about 15 minutes. You can also reheat in the microwave until warmed through, about 3 minutes.